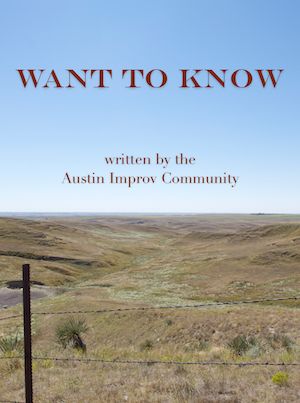 Here’s my Christmas gift to the Austin improv community. It requires a little explanation, though. Back before Facebook assimilated everybody, the forums at austinimprov.com were how the AIC connected and communicated. This included everything from Maestro signups to discussions on improv theory to total silliness. And, like any Internet forum, it had the occasional post by spambots, which were often almost random collections of words. One fateful day—April 24th, 2012—a spambot made a post that sounded vaguely like the beginning of a story. Peter Rogers quickly added a few lines to complete the scene. Brad Hawkins added another chapter. And just like that, the members of the AIC were yes-anding themselves into an entire Western saga. That’s right: it’s an improvised book. The story is just under 20,000 words, about 80 printed pages. Should be a quick read for your holiday break. You can download the Kindle and E-book versions below. Or you can view the original, untarnished “want to know” forum thread here. Hope you enjoy it. Happy holidays to all of us, from all of us.